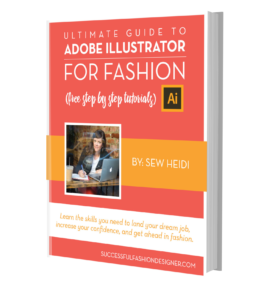 How do you make sure you’re fashion portfolio is updated and you’re prepared for opportunities that fall in your lap? Why does it always seem like when an opportunity presents itself, you’re never ready. A friend posts on Instagram that her brand is looking for a freelance lingerie designer…and you’re perfect for the role. A recruiter reaches out on LinkedIn asking if you can meet with a women’s contemporary brand in the Garment District this Friday…and you’re perfect for the role. An ex-coworker texts you that their TD just quit and they need a replacement now…and you’re perfect for the role. Your portfolio is not ready. And it’s not like you can put your whole life on hold to get it done. So you miss out. On this opportunity. And the next one. And the next one. Which is scary and puts you in a vulnerable situation. You never know when your main client may walk away. You never know when a tidal wave of layoffs hit your brand and you don’t make the cut. You never know when the opportunity to interview for your dream job will fall in your lap. But your book is never done because it isn’t a priority until you needed it YESTERDAY. And you feel terrible that opportunities like this keep slipping through your fingers. Which is why I wrote this book. To help you get your sh!t together and be ready for these opportunities. Does it take time? Yes. Is it hard work? Yes. Are you magically going to be prepared if you don’t put in the effort? No. So, how do you make sure you’re prepared? Well, first, it shouldn’t take you that much time. 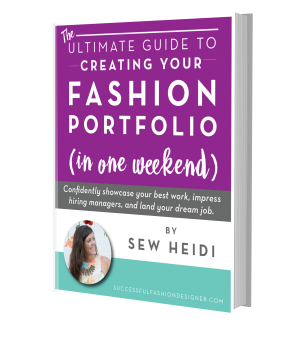 If you’re perfect for this opportunity that falls in your lap, you should have some base of fashion portfolio to start with. Under ideal circumstances (if, after reading this book, you put your portfolio together using the strategies I’ve given you), you may be able to just make a few quick edits like swapping out some key trend driven items for things that are relevant right now. An afternoon “should” be all you need. Second, if you’re actively job hunting, you must be prepared. Spend a weekend and get your book updated. Now, if it’s really a last minute scramble, pull together what you can. Don’t put the pressure of a “perfect” portfolio on yourself. I’ve never kept my website up to date with new work, and many other fashion designers I know who utilize their network and contacts to get work don’t either. If it’s an in person meeting, maybe in addition to your “outdated” portfolio, you can grab a catalog or lookbook from the current season (the one that’s already at market), a few physical samples (brands are always impressed when you bring physical samples to an interview), and your sketchbook. Sometimes, all it takes is an explanation. It’s easy to overthink what is required or to set standards higher for ourselves than other people set. It’s one thing to be unprepared (don’t do that), but it’s another if you’re not actively searching and the brand needed you to start yesterday. Explain why your fashion portfolio isn’t fully updated, and bring whatever other supporting material you can to show recent work. I’m including this question not because I think it’s something you should do, but because a lot of you asked it. Listen, when it comes to these random opportunities when you run into someone at an event you think may be a good match for work, you may think the best thing you can do is bust out your phone and start scrolling through photos of your work. It’s not. Don’t do it. Please, just don’t. It’s like showing pictures of your kids or your dog to people. I hate to say it, but they don’t care. Nobody wants to see them. This may seem harsh, but these casual events are not the right time. Now, if this is a networking event specifically for job hunting (like a job fair or similar), that’s a completely different scenario. You should be showing up to that with your book (physical or digital on an iPad) and prepared to show your work. But we’re talking about casual industry get togethers like meet and greets of happy hours. Unless someone there is begging to see your designs (they probably aren’t), your interactions are conversational, not visual. As a backup, if you want to keep some portfolio photos in an album on your phone, go ahead. But do NOT pull that thing out of your bag and start swiping through photos unless they really ask for it. No one wants to be approached at these events by fashion designers desperately looking for work who are showing their portfolio to anyone with two eyes. They may give you the courtesy of looking, but 99% of the time, they don’t care. I know this sounds insanely harsh, but it’s true. I told you I’m not one for sugarcoating, so there it is. Coated with chunks of sea salt instead of sweet delicious sugar. But, as much as I don’t like to sugarcoat, I do like to give advice on what you should be doing. Keep it simple, and if there’s an opportunity, it will present itself. I’ll tell you what the rest of this conversation should look like in a minute, but first, do you notice what all of these “elevator” pitches have in common? And they’re specific (read: niche). If there is an opportunity, the person you’re talking to will connect with that niche and the conversation should start to flow naturally. Now that you’ve kept it short and niche, you can continue having a conversation like a normal person. Don’t think about this like networking or trying to find work. Think about it like having like minded conversations with people who are in the same industry as you. Michele Mavi, a career expert and recruiter at Atrium Staffing, says it well in her article on networking. Just this simple mindset shift can do wonders and change the tone of the conversation from “I am looking for work and will take any opportunity” to “I really love working in fashion and meeting people like you”. And it’s that second attitude that will come off more natural, more genuine, and will open more doors than you may realize. I know it’s really hard to do, especially if you really need work. I know it is tough out there. But I promise, confidence and casual conversation goes so much further than forcing your book on someone who is only pretending to care. It’s best to get their contact info so the control is in your hands to follow up…and then, you do just that. Follow up. Send them a soft pitch about how you can help them out. Now that you know what to say, let’s talk about a few things you don’t want to say. If you’ve been guilty of sounding like this, don’t feel bad. We’ve all been there, and we’ve all kicked ourselves later for having said something we shouldn’t have. Don’t beat yourself up, just be aware and try to do things differently next time. No one wants someone with a little experience in everything who’s willing to do anything. And remember what we talked about how this is like dating? No one wants the guy or girl who’s so desperate, they’ll go out with anyone. I know this feels hard. Because what if that person has a footwear opportunity but you tell them you’re a handbag designer? You’ve lost the opportunity, right? Remember, this is always a two way conversation. Make sure to ask about them too, it’s surprising how many people don’t do it, and it can go a long way. Plus, asking and learning about the other person will help you discover opportunities you may miss if you talk about yourself the whole time. BOOM. There is your conversation and your opportunity. If you start out with “I’m looking for new opportunities and am pretty much willing to do anything – I have experience in footwear, accessories and handbags,” the person has glazed over before you’ve even gotten to what categories you can do. Seriously, watch interactions like these with other people. One guy starts rambling about how he’s looking for any kind of work he can get and all the lengthy experience he has, and the other person totally checks out. Keep your line simple and clear. If there is an opportunity, listen for clues and guide the conversation. Like your fashion portfolio, this is an art, not a science. Practice as much as you can, and you’ll get better with time. 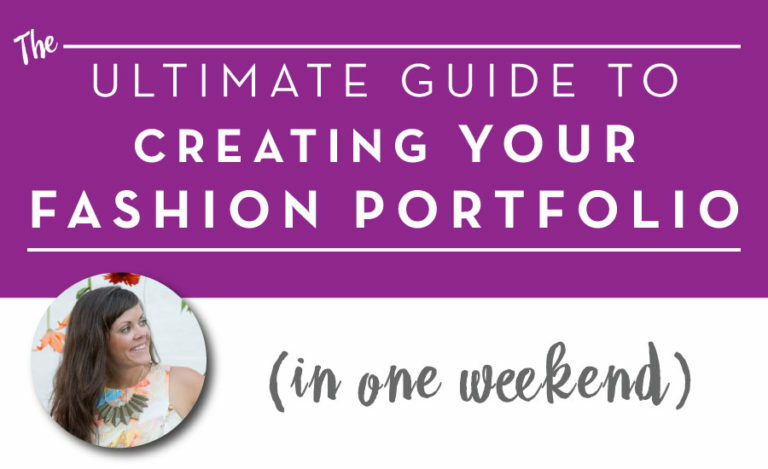 What are the best practices to keep your fashion portfolio up to date? Set time aside to update it! Once or twice a year, block a day on your calendar to do this. Do it now so you don’t forget. Maybe you even make a pact with a friend to help hold you accountable. Whatever you have to do, commit to 3-6 hours a year. It’s really not that much! Now, when that day comes, are you going to say you’re too busy…that you’ll get to it next week…and then next week…until next week never comes? Perhaps. That’s something only you can control. I can encourage and give you all the tools you need, but if you don’t actually do the work, there’s not much I can do for you. Other than this, use the strategies I’ve outlined in this book. 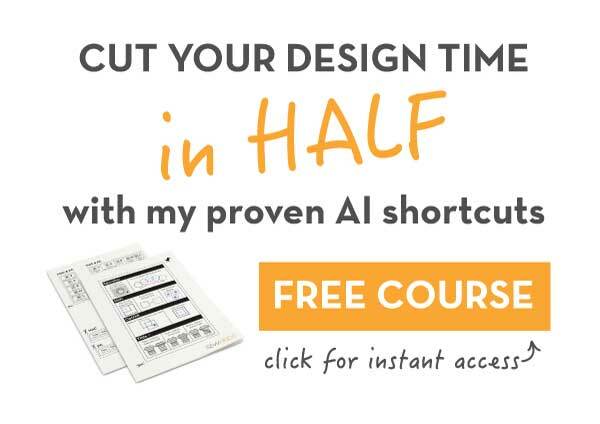 You don’t need to create another fancy website. You don’t need to create a whole new book. It can be as simple as updating some PDF layouts and your physical book (removable tape is your best friend!) with a few updated and relevant styles. Yes, at times, you may need to do a major overhaul. But remember, like the title of this book says, you can get it done in a weekend. 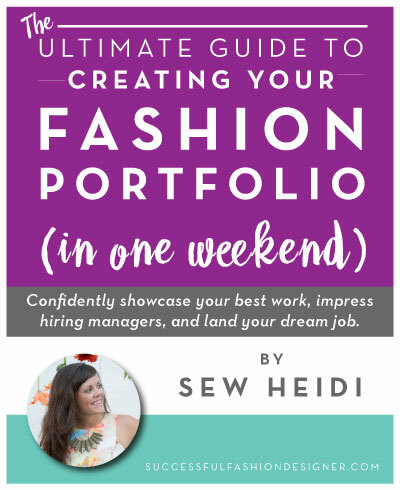 Because your fashion portfolio is not a full-time job or another career.